Robots to help conquer 2013 Resolutions! Lets get 2013 started right! Did you make some resolutions? Did any of them involve loosing a bit of weight? If you have problems keeping up with those resolutions, not to worry, the robots are here to help you! Each year begins with high hopes and expectations, but it also begins with the Consumer Electronics Show where companies big and small show off their new and future gadgets to make our lives better. This year, there are a few of these gadgets that have interesting implications for our gastronomic lifestyle. That’s right, it’s a fork that tracks your eating habits and records such data as how long it took you to chow down, and even goes the extra level (that we did not know was necessary) to measure the granularity of this meal with fork bites per minute and how long between bites. There is of course wired or wireless connectivity to send this data to an online dashboard where you can see how often you finish the meal before the opening credits of your favorite tv show or movie. HAPIfork will retail at a pocket burning $99…maybe they should offer a family pack? But the resolution keeping gadgets don’t stop there. Samsung has announced the new T9000 Refrigerator. This is a refrigerator / terminator hybrid. Ok, maybe not so frightening. 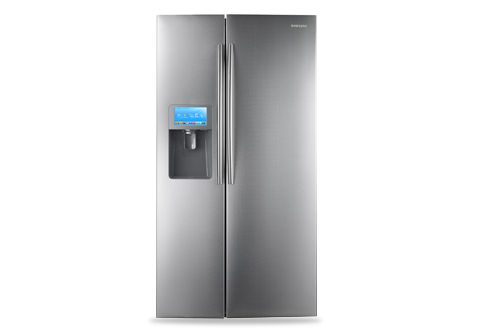 Essentially the T9000 is an update to Samsung’s already available line of smart refrigerators, the 28 cu. ft. RF4289HARS and the 30 cu. ft. RSG309AARS. The whole line of refrigerators sports Wi-Fi connectivity, an LCD screen (8″ for the available models) running on a Linux OS which can connect to Twitter, Evernote so you never forget your grocery list, and even links to coupons so feed the extreme couponing addiction. The new model will set you back $4,000, but that’s a small price to pay for conquering your new year’s resolutions!